On November 30, 2007, H.E. 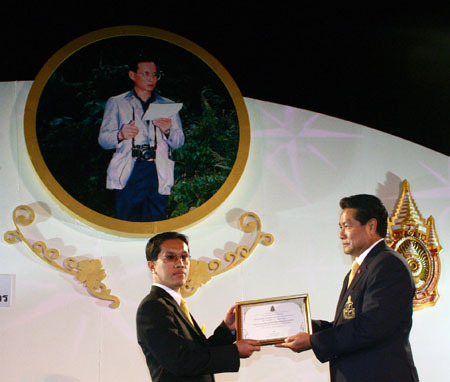 Mr.Palakorn Suwanarat, Privy Counciller delivered a certificate of honorable mention to Agency for Real Estate Affairs (AREA) represented by Mr.Wason Khongchantr, AREA Managing Director.�The competition on the ideology of sufficiency economy was an event in accordance with the ceremony of the eightieth years birthday of His Majesty King Bhumibol Adulyadej.�The competition was organized by the Office of the Royal Development Projects Board. AREA is a Thailand's real estate information and valuation centre serviced in Thailand and Indo-China.�In 2005, AREA won the ethical award from the Thai Chamber of Commerce.�It is also the first real estate consultant firm certified with ISO 9001-2000 since 2000.